Butayakitori, an appetizer at the Pa Pa Ya Asian bistro in Lower Parel, Mumbai, has a playful presentation—the pork belly skewers, dressed in an apple and betel nut tartar, come in ceramic-ware shaped like a pig. The dish got a makeover for the Asian Hawkers Market II (AHM II) food festival (12-14 February) at the Select Citywalk mall in New Delhi. The Butayakitori traded playful for pragmatic, and came in easy-to-hold, palm-sized paper plates. Four bites and you could finish the dish; no fuss, no mess. Devised by chef Saurabh Udinia, who now has experience of at least four food festivals under his belt, the dish was one of six showcased at AHM II ahead of Pa Pa Ya’s slated launch in New Delhi later this year. “It (the festival) was a chance to get some early feedback for Pa Pa Ya food from Delhi visitors," says Udinia on phone. “I chose dishes based on three criteria: the most popular dishes at the Mumbai restaurant (such as the Butayakitori), what I wanted to showcase (like the Tuna Tataki Pizza, which is not a money-maker but interesting to me as a chef); and what could be prepared in a 12x12ft stall with very little equipment (we managed to sneak in a teriyaki grill)," he says, adding that they also managed to price the dishes 25-40% below the restaurant charges, in keeping with the lower overheads at the festival. 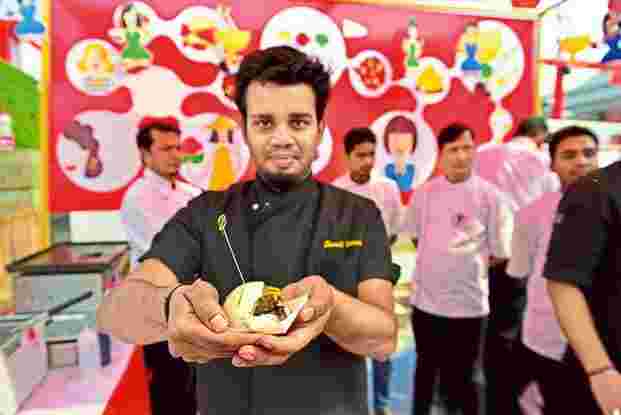 Food festivals are quickly becoming a testing ground for chefs to try new menus and concepts, including Gazpacho Golgappas and Ragda Keema Kaleji. Across Bengaluru, Mumbai, New Delhi, Chandigarh, Goa and now Pune, food festivals are also morphing to include a large side of entertainment, from live concerts to activity zones. In their contemporary avatar, food festivals are less than two years old in India. Ruchi Sibal, who co-founded the New Delhi Palate Fest with Aditi Kapoor, recalls showing videos with 3D modelling to restaurants ahead of the festival launch in 2014 to help them visualize what the event would look like. “In 2014, we got mixed reactions from restaurants. Some people needed explanations on what the tents would look like and how we were planning to combine food with music and arts in an outdoor setting. Others who had seen food festivals abroad could picture it," says Kapoor. When Sibal and Kapoor started out, the idea was to organize the festival as a large picnic, with a mix of restaurants in terms of budgets, cuisines and experiences. “We went through a massive curation," says Kapoor. “Our wish list had top-tier hospitality names as well as home bakers. The only thing we categorically did not want was street food." They organized food under sub-categories like restaurant space, casual (read budget) restaurant space and market space to buy processed foods and ingredients. And added masterclasses by chefs, a children’s activities zone and performance arenas for musicians. At the SteppinOut festival on 21 February in Bengaluru’s UB City, some 19,000 people queued up to sample food from over 30 restaurants. Many of the city’s favourite brands were there, but their agendas were clearly different from business-as-usual. Red Fork, for instance, had separate day and dinner menus, distinct from the offerings at its Indiranagar restaurant. Its principal aim, though, was to help the consumer establish a connect with its sister brand, an Internet-first food delivery service called Chefkraft, with which it shared a stall. Other familiar names on the city circuit, from SodaBottleOpenerWala, which opened last year, to the Lakeview Milk Bar, established in 1930, had sections of their regular menus, clearly hoping to pull in the loyalists. Alongside food, the new brand of festivals is also about spectacle. If Bengaluru’s SteppinOut had the Indigenous Fakirs taking the stage, followed by a screening of the Jon Favreau-starrer Chef, Delhi has seen performances by musicians like Hari and Sukhmani, masterclasses by chefs like Ranveer Brar and Rohan D’Souza. Coming up next is a mixed martial arts contest by the Super Fight League at The Grub Fest 2016 in New Delhi from 18-20 March. “The food festival scene has just started," says Arjun Jain, one of four co-founders of The Grub Fest. “It will be the survival of the fittest. The way I see it, it’s like the music industry a few years ago. Everyone had artistes and DJs, but only a few, like Sunburn, have survived." The Grub Fest is travelling to Pune this year, where one of the highlights is a table for 32 some 60ft up in the air. Nakul Chandra, business development head of restaurants like The Fatty Bao and Monkey Bar, which participated in last year’s Gastro Bazaar and AHM II, says that far from being a distraction or dilution, entertainment and shopping are essential ingredients of the festival experience. “The better the overall package, the better the sales. Having food, entertainment, music in one package, that is the way forward. Such festivals are about discovery, about trying something you haven’t seen or heard or eaten before," he says. “Food festivals are a nice, new thing," says Mayur Sharma, host of the TV show Highway On My Plate. “The consumption of food is not just a solitary activity, there’s music and entertainment too. (So one) eats, of course, but also enjoys the experience of eating in that setting," he says, adding that he visits every food festival he can. At the Palate Mini (12-14 February, Nehru Park, New Delhi), he discovered a newish Persian restaurant he liked called Nooshe Joon. In October 2014, Sharma and show co-host Rocky Singh also put their name on the banner for the first, and so far only, Bengaluru Food Festival. “Our touch point whenever we think of associating with an event is whether this is going to push the boundaries of food, especially Indian food, in the country and abroad," says Sharma on phone. The association with the Bengaluru Food Festival was a one-off for both, but Sharma says that for him it was an “opportunity to get boots on the ground", talk to people in the food business as well as visitors, and gather intelligence about “microtrends". For restaurants, the festivals are often a branding exercise rather than a money-making venture. And a chance to plug gaps in social media campaigning. “We (Monkey Bar) thought we were reaching out to the right audience with our social media and other programmes," says Chandra. “We see ourselves as the neighbourhood bar. At the Vasant Kunj (Delhi) Monkey Bar, we see a lot of moms with their children and local residents of C-block with their families. But when we went to a bazaar organized by Little Black Book (in February last year) in Delhi, we (found) people who said they’d avoided us because they thought we were a bar. The menu at the food festivals was focused on food—mainly burgers and sliders; there were no drinks," Chandra says. The cost of a stall at some of the better produced food festivals starts at ₹ 50,000 for three days. Sonny Walia, founder of Gourmet Planet India, which organized The GIG Carnival on 5-7 February at the Jawaharlal Nehru Stadium in New Delhi, says the cost of putting up a stall is between ₹ 50,000 and ₹ 5 lakh. Still, there are several reasons why a food festival makes business sense for participating restaurants, says Insia Lacewalla, founder of Small Fry Co., a food consultancy and caterer. “The eatery could be a hole-in-the-wall restaurant that wants to be discovered by a different set of customers at the festival. Or it could be a posh Bandra restaurant trying out a new menu or a new concept like pop-up," she explains. The programming, Lacewalla explains, is driven entirely by the organizers. “Some try to keep the participating restaurants in mind: If there are 60 stalls at a two-day festival, the organizers could look at the potential conversion for each participant, for example. Other organizers are concerned with offering more choice to people. Both models are running," she says. While curating The GIG Carnival, Walia says his rationale was to “show what it is to be in India in 2016". 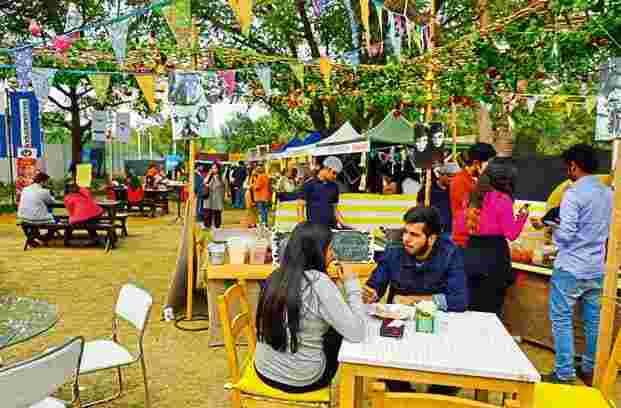 The carnival had 48 restaurants spread over 10 acres, a mix of traditional and contemporary crafts for sale, and performances by Papon and Karsh Kale. The festival attracted 16,000 people over the three days. The most popular food stalls were the ones from outside Delhi, like Tundey Kebab from Lucknow, and eateries from the hard-to-access Old Delhi by-lanes, Walia says. From a consumer’s point of view, says Lacewalla, food festivals make sense. “I may not want to spend thousands at Heng Bok before I figure out if I even like Korean cuisine. Food festivals offer a lot of choice. I can find my answers there for a lot less money, and then I may want to go to Heng Bok knowing I will likely like what I get." The Grub Fest, Jawaharlal Nehru Stadium, New Delhi. Itsy Bitsy Food Fest, High Street Phoenix, Senapati Bapat Marg, Lower Parel, Mumbai. The Grub Fest, Royal Palms, Koregaon Park, Pune. The SteppinOut Easter Market, The Collection @ UB City, 24, Vittal Mallya Road, Bengaluru. The Bhukkad Flea, Waterfield Road, Bandra-West, Mumbai. Bengaluru Market By Karen Anand—Edition II, VR Bengaluru, Whitefield Main Road, Mahadevpura, Bengaluru. Bangalore Food Fete II, KTPO Trade Centre, Bengaluru.